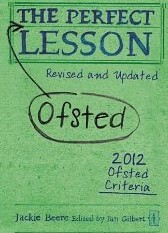 The Perfect Ofsted Lesson by Jackie Beere is edited by Ian Gilbert so you know that the focus is going to be on Independent Learning before you open the cover. There is a huge amount in here for teachers of any subject despite it being a relatively short book. The main areas the book covers are: progress in learning, assessment as learning, independent learning and collaborative learning. There are loads of strategies to use in the classroom along with tips for what an observer is looking for. I have three copies of the book to lend to anybody who wants them (first-come-first-served! ).